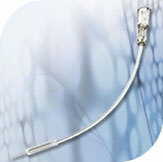 Logo: Echonox ultrasound echogenic steel is available for most types of biopsy needles. Where Echonox is available it is indicated by the logo. Please enquire. 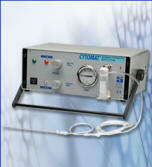 For Antenatal Diagnostics, Cytologic Biopsy and Medicine or Anaesthesia injection before prostate biopsy. Minimum order : 1 box 20, 25, 30 and 60 pcs. 3R-S® is a special syringe for cytological sampling that can be used single-handed, provided with valve for the complete recovery of specimens. Can be used with standard needles with lauer lock fitting. The importance of accurate preoperative localization of mammographically detected lesions has been proved. There are several mammographically guided methods, all with their advocates. system is used, while a dye alone, commonly methylene blue, is used in 8% of cases. Wire dislodgement and widespread diffusion of the liquid marker into surrounding tissue are well known disadvantages connected with the above methods The need for a stable marker has been pursued through a special biocompatible charcoal powder suspension specifi cally treated for this purpose. CARBO-REP® is available in pre-filled 2 ml vials, easy to inject into the chosen site to mark the path to the lesion for the surgeon. One more interesting advocate of CARBO-REP® is the possibility to indicate the exact location of the site of initial biopsy in instance of the subsequent development of a mammographically occult cancer in proximity to the initial biopsy site. MAMMOREP LOOP® is the latest breast localization system. The ergonomic handle of MAMMOREP® LOOP allows the operator one-handed use. A single motion is required to place and retract the loop-wire. The LOOP shape of wire makes it possible for precision placement and prevents forward/backward migration during patient’s transport. A marking bead on wire, coming before the stiffening close to the loop, serves as a 1st “landmark” for the surgeon during the surgical excision of the suspected lesion. The localization wire is repositionable. The needle is made from ECHONOX®, the echogenic stainless steel, covered by international patent, and provided with centimetre marks and sliding depth stop, colour coded. SGL-S,M or L ( cannula length 2cm ) 0.3mm diameter : Connection line lengths S ( short ) M (medium ) and L ( long ) available, 27 gauge. SGL® is a set for galactography designed to allow easy injection of contrast liquid into ducts in a controlled and safe way, with a thin blunt cannula that comfortably dilates ducts with no injury and pain. Available in 2 needle length and 3 different length of connection line. Used in the collection of large quantity of cells by ductal lavage ( DL).